"It's better to face madness with a plan than to sit still and let it take you in pieces"
Five years after it began, a handful of scattered survivors remains, including Malorie and her two young children. Living in an abandoned house near the river, she has dreamed of fleeing to a place where they might be safe. Now that the boy and girl are four, it's time to go, but the journey ahead will be terrifying: twenty miles downriver in a rowboat--blindfolded--with nothing to rely on but her wits and the children’s trained ears. One wrong choice and they will die. Something is following them all the while, but is it man, animal, or monster? My Thoughts: Terrifying, creepy, unsettling...just a few adjectives to describe this book. This book was scary. 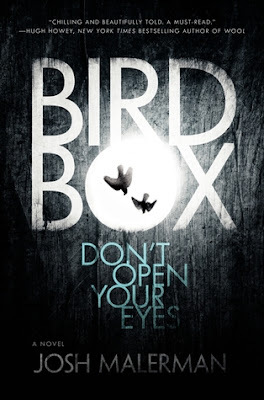 I love horror/thriller novels and this one definitely creeped me out. I think what made this story so scary was not knowing who or what evil was causing society to go insane. What lurks outside? What is causing people to kill themselves and others? Will the survivors ever be able to live a normal life again? These are some of the questions I asked myself as I was reading this story. Malorie, the main character, not only fears for herself in this strange, new world, but she also worries about her two children. How can they properly protect themselves when they don't know who or what the enemy is? I couldn't give this book 5 stars because the ending felt a little incomplete and open-ended. I was left with too many questions. Maybe the author did this on purpose so that the readers can imagine their own conclusions, but I really wanted more of a finality to the story. Who knows? Maybe there will eventually be a sequel. That would be cool. I definitely recommend reading this book if you love creepy, thrilling stories. Just don't read this late at night before bed. Trust me. This has been on my TBR list for so long and I was umm'ing and ahh'ring about reading it but your review has definitely made me want to pick it up. I absolutely loved Hex by Thomas Olde Heuvelt so if you like spooky/horror then I'd really recommend that. All The Books: June Book Outlet Haul! All The Books: June Amazon Book Haul!